I got in my 2007 Aspen with 95k miles tonight and the above mentioned lights come on every time I start the vehicle. I checked the codes with a simple blue tooth code reader, nothing, no codes at all... just the ABS, Brake, ESP/BAS, Traction Control dash lights. 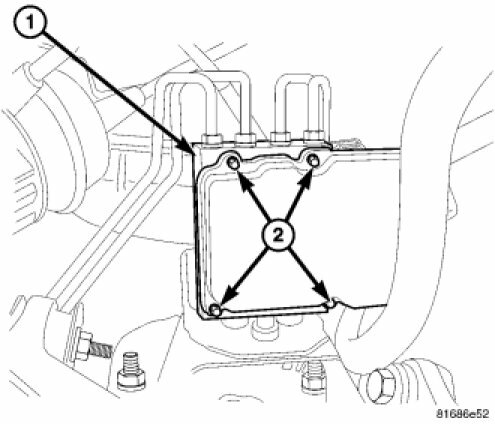 Neighbor had the exact same issue on his Jeep for 2 years.. had someone finally scan it using an abs equipped scanner, and found it to be a wheel speed sensor... $40 part and 10 mins to change..
Code C2200 "ANTI-LOCK BRAKE MODULE INTERNAL"
Is it a very difficult task to replace? Is it just a module and not the unit with all the brake lines running in and out of it? Last edited by skid2964; 05-14-2016 at 08:07 PM. 1. Remove the left front tire and wheel assembly. 2. Disconnect the electrical connector from the ABM module. 3. Remove the module mounting screws (2). 4. Remove the module from the HCU (1) on ESP vehicles be careful not to damage the pressure sensor or not to touch the sensor terminals on the HCU side or the contact pads on the ABM side when removing the ABM. 1. Position the module on the HCU on ESP vehicles be careful not to damage the pressure sensor or not to touch the sensor terminals on the HCU side or the contact pads on the ABM side when installing the ABM. 2. Install the mounting screws (2) and tighten to 2.5 Nm (22 in. lbs). 3. Perform the ABS verification test with a scan tool. The Antilock Brake Module (ABM) is a microprocessor which handles testing, monitoring and controlling the ABS brake system operation. The ABM is mounted on the top of the hydraulic control unit (HCU). The ABM operates the ABS system and is separate from other vehicle electrical circuits. ABM voltage source is through CKT A111 (fused B+). NOTE: If the ABM needs to be replaced, Perform the ABS verification using a scan tool. When the ignition switch is turned-on the microprocessor is tested. If an error occurs during the test, a DTC will be set into the memory. However it is possible the DTC will not be stored in memory if the error has occurred in the module were the DTC's are stored. The ABM contains a self check program that illuminates the ABS warning light when a system fault is detected. Faults are stored in memory and are accessible with the scan tool. ABS faults remain in memory until cleared, or until after the vehicle is started approximately 50 times. Stored faults are not erased if the battery is disconnected. Last edited by cloutiersi; 05-16-2016 at 09:44 PM. I see that this is an older thread. However, I'm having a similar issue. My wife was coming home in her 2007 Chrysler Aspen and noticed the car would no longer accelerate beyond about 30 mph. All the lights mentioned in the thread came on. I took a look at it the next day, it crank up with no problem, except the RPM was a bit higher and then it settled after a minute or so. The lights remained on. I drove it and after a few miles experienced the same deal, won't go passed 30 mph although the RPM continues to rise (while giving it gas). I found this thread, got a scanner with ABS, but only gives code U0401 which is not specific enough. An ABS module cost a bit, so want to know the issue before just changing parts. Any advice is appreciated. I had a problem with the ESP/BAS and Traction control lights staying on. Found out that the previous owner had the airbags replaced under a recall and while being done the clockspring in the steering wheel was damaged causing these lights to come on. From what I know there is a steering angle (?) adjustment on the clock spring and if that is damaged then it causes this problem. Unfortunately, the part from Chrysler is $900 + labor. I took it back to the dealer that did the recall and they agreed with the damage to the clockspring and are replacing it free of charge under warranty. If yours has had the recall done for the airbags this may be your problem, it was for me. The recall bulletin has a section warning the technicians not to damage the clockspring while performing the recall, so I'm guessing it happens more than Chrysler would like. Hope this helps. Took it to a shop and the throttle position sensor and a hose with vacuum leak was replaced. That cleared all the lights and Aspen driving fine. Only cost me $292. Guess I'll have to try to get the dealer to fix it for me!